We had a few visitors to our tiny apartment in June and we enjoyed seeing Tokyo through a newcomers eyes once again. I was almost sad to stop riding my bike to work each morning because the hydrangeas on this nice garden path were just about to bloom. Almost, but not totally. A break from the race is a good thing. My brother Dirck, sister-in-law, Jill and James's friend, Kevin, came to visit. We took another yakatabune ride on Tokyo Bay, this time at night. Sneaking a picture of a wedding at Meiji-Jingu shrine in Harajuku. I love the look of the little boy on the right. Get me out of here and these clothes! We even took a short trip to Hiroshima and Miyajima. The tide was out this time, leaving the torii to be surrounded by visitors and people clamming. Beautiful sake barrels at the shrine on Miyajima. In May and June, Japanese apricots cover the ume (うめ ) trees and are for sale in grocery stores all around Tokyo. It's the season of homemade fruit liquor. James and I are big fans of umeshu, the sweet, fruity liqueur that is called "plum wine" but is actually made from these Japanese apricots. I've yet to figure out why we call these apricots, plums. Before we left for America for the summer, I looked up a recipe for homemade umeshu and I tried my hand at a simple recipe. Start with freshly cleaned and stemmed green apricots. Rock sugar, white liquor and a big glass jug are the only other ingredients. Layer apricots and sugar until you are about tw0-thirds full and then pour the white liquor over the top. We'll let you know how it tastes in about a year. School finished on Friday, June 4th and the days since have been a whirlwind of Sayonara parties, birthday parties and visitors. 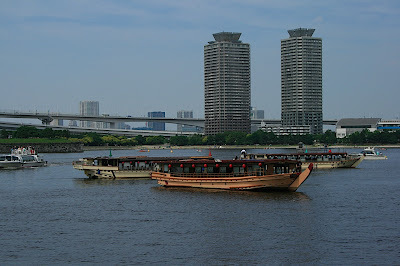 Last Sunday, we took a party cruise on a Yakatabune for friends Moegi and Kuniyo's birthday. 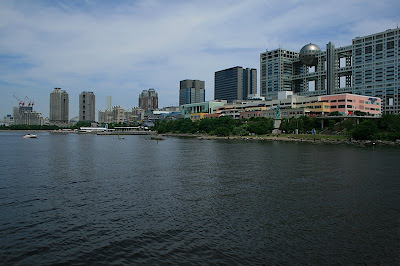 The cruise lasted about 2 hours and drops anchor for a while in Tokyo Bay just near Odaiba and the Rainbow Bridge. We lucked out with gorgeous weather. Lots of other boats were out partying with us that day. This is a great spot to be for the August O-Bon fireworks. This trip was a nomihodai/tabehodai which means all-you-can-eat and all-you-can-drink in 2 hours. The girls are making okonomiyaki and monjyayaki. Monjyayki is a cabbage, egg, seafood, mochi and meat based pancake which you finely chop and then spread out over the grill until sticky and browned. At first glance it looks unappetizing but tastes pretty good. We also had yakisoba and garlic rice. Cooking is half the fun. 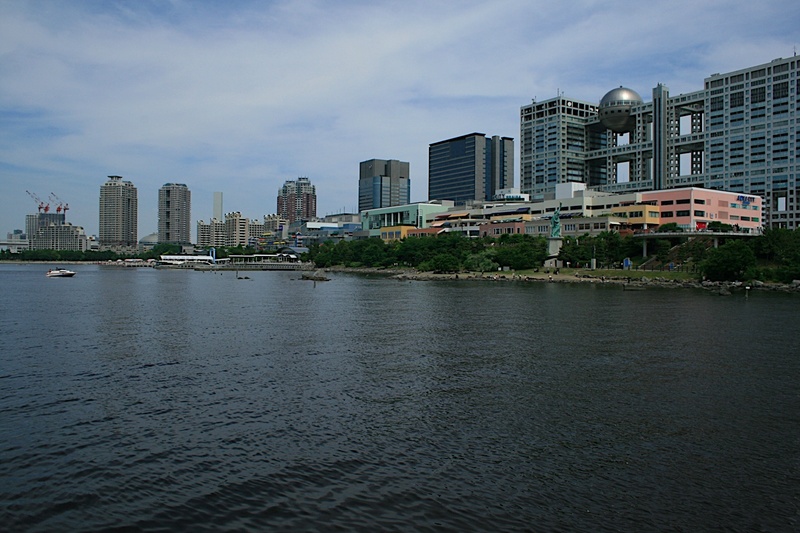 View of Odaiba and the futuristic Fuji TV building from the roof of the boat.